Intermediate Area Catalog, Beginnings – James A. Doyle, Ph.D. Since beginning at Dumbarton Oaks in July, I’ve begun traveling intellectually south from the Maya area and into the Intermediate Area. 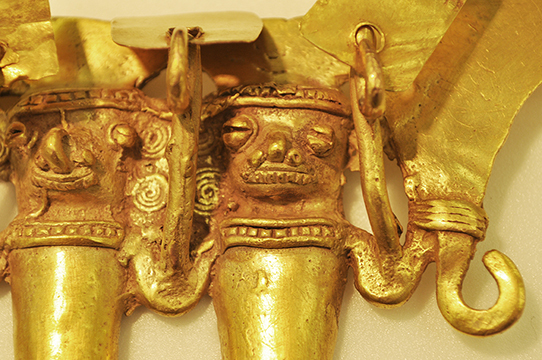 With the goal of producing a definitive catalog of the Dumbarton Oaks collection from the Intermediate Area in the coming years, I’ve begun working with my colleagues in Pre-Columbian studies to lay the foundation for the eventual publication. The initiative is under the direction of Colin McEwan, Director of Pre-Columbian Studies, and I work along with our colleagues at the museum, Juan Antonio Murro and Miriam Doutriaux, and the temporary Pre-Columbian Studies coordinator, Katie Caruso. Special thanks also go to Gudrun Bühl, Museum Director, and Jan Ziolkowski, Director of Dumbarton Oaks, for supporting the Intermediate Area Catalog project efforts. An obvious first issue: what do we call this area? Is Intermediate Area still a useful term? Some articles in the 2003 Dumbarton Oaks volume Gold and Power in Ancient Costa Rica, Panama, and Colombia (Quilter and Hoopes, eds.) address this issue. 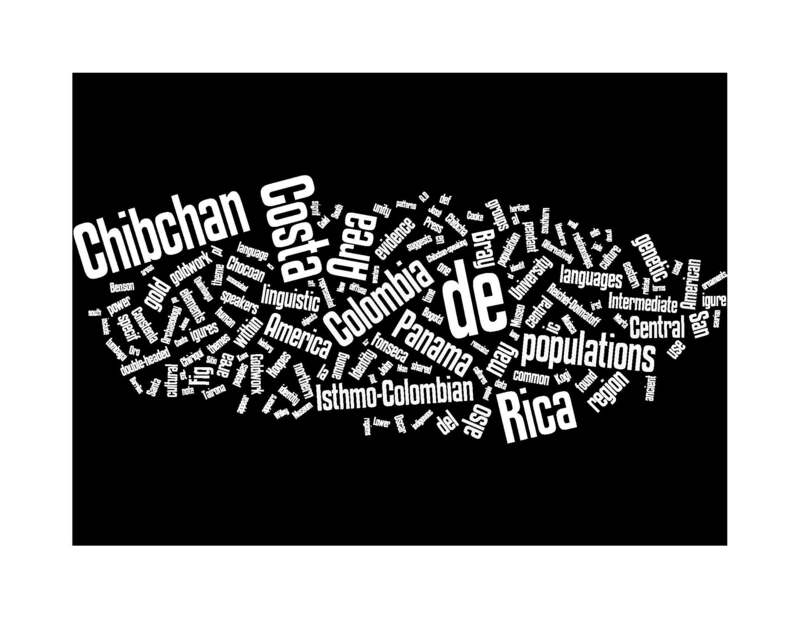 For example, (using Wordle), here is a cloud from the chapter by Hoopes and Fonseca Z. proposing an Isthmo-Colombian Area. 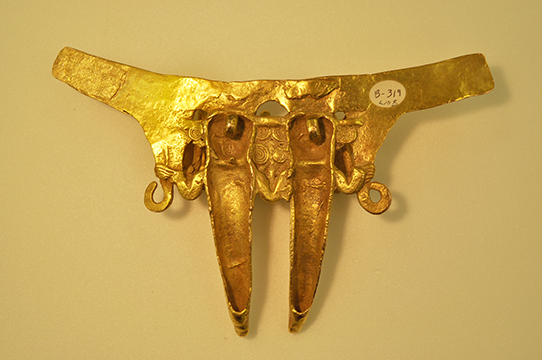 Conversations with visiting scholars, such as Dr. Richard Cooke of the Smithsonian Tropical Research Institute and Eugenia Ibarra Rojas from the Universidad de Costa Rica, have sparked new thoughts about how to characterize this area with respect to its art and archaeological cultures. Most of the objects from this collection are online through the Dumbarton Oaks museum, and the entries include bibliography, exhibition history, and acquisition information. I created a database building on the museum’s information to include other information such as iconographic notes, comparanda, notes from conservation assessments, and prior reports by scholars who have studied the collection. These prompted a colleague to question, is it a bird? Is it a plane? My thoughts go to: crazy, nightmarish butterfly? Thus began the journey into Intermediate Area studies. After a month, I see a lot of exciting opportunities for this catalog, both with the pieces in the DO collection and in the broader archaeological and art historical scholarship of the area. Stay tuned for more updates as we continue documenting the objects and building the project bibliography. In the NMAI project which I was delighted to be part of, we called the area we were working with Central America. I would advocate for that kind of neutral (geopolitical) identification because all the other established options are either inherently judgments of a lack (intermediate are– intermediate to where? the other areas are by definition superior); or assume that there is some unity to a linguistic identity (Macro-Chibchan doesn’t work for me for this reason). You also need to be wary of the inherent boundedness of regionalization– many manifestations in this region should be thought of as networks reaching outside any established region. Isthmo-Colombian can work, if you are careful to keep it as a geographic container, and place as much emphasis on what (in the publication accompanying the NMAI exhibit) I call connecting, as about the local, regional, and bounded. Thank you very much for these helpful comments! The DO team took a field trip to the NMAI exhibit and very much enjoyed the presentation. We will also be at the upcoming workshop so I look forward to continued conversation. Issues with the “Intermediate Area” label were raised by Payson Sheets at a Dumbarton Oaks symposium back in 1987. His article on “The Pervasive Pejorative” remains relevant and merits a close reading. The term “Lower Central America” is, for me, even more problematic. It was apparently coined by Doris Stone, who used it to contrast the cultures of eastern Honduras, Nicaragua, Costa Rica, and Panama with “Upper Central America,” by which she meant the Mayas and other Mesoamerican cultures. Although many people think “lower” referred to “down” on a map, it seems clear to me that Stone intended it to mean inferior cultures. I coined “Isthmo-Colombian Area” as a neutral, geographic descriptor that did not imply “intermediate” or (as implied) peripheral status. As you know, the emphasis that I and Oscar Fonseca placed on this focused on Chibchan-speaking peoples (an attempt to create a parallel with the informal understanding of “Maya Area” as corresponding to territory occupied by Mayan-speaking peoples). I still like the term, but have come to appreciate that a focus on the Central American isthmus and northern Colombia excludes the Antilles in particular, which are part of a larger unit I’ve referred to in presentations as the “American Mediterranean” (based on the observation that the Caribbean Sea is about the same size as the Mediterranean Sea and is similarly surrounded by a variety of peoples who interacted via maritime contacts, a body of water ringed by land masses within which there was a long history of ongoing interaction among populations). This is a nod–not yet completely theorized–to Immanuel Wallerstein’s concept of a Mediterranean World-System in the hopes that considering an “American Mediterranean” might bridge Yucatan-Antilles-South America-Central America studies in a fashion parallel to the way that scholars have looked at Southern Europe-Italy-Greece-the Levant-Egypt-and North Africa. I think it’s a fruitful way to see the region and one that may ultimately help us to conceive of a seamless interface from Mesoamerica down to the Amazon and Andes. The traditional culture area approach has, in many ways, put us into unnecessary boxes. Colleagues at the University of Leiden have used the term “Pan-Caribbean” to refer to the larger Caribbean Basin, one that includes the Central American littoral as well as the Greater and Lesser Antilles. This is why the Facebook page I’ve created is labeled “Isthmo-Colombian and Pan-Caribbean Culture.” It is under this paradigm that researchers such as Alex Geurds have undertaken fieldwork in Nicaragua to complement that of Corinne Hofmann and colleagues in the Antilles. I will be the first to acknowledge that most Mesoamericanists, Andeanists, and “Intermediate Area” specialists (myself included) are not especially conversant in Antillean archaeology. I think that needs to shift, especially given what Antillean colleagues have termed a “post-Rousean paradigm” of acknowledging that the Antilles were much more than recipients of Arawak migrations northwards from Venezuela. They were also interacting with people on the Mesoamerican and Isthmo-Colombian mainlands–probably from Archaic times (if not earlier). One of my (relatively minor) misgivings about the scope of the NMAI exhibition is that the geographic concept of Central America excluded northern Colombia. As I’ve pointed out using data from linguistics and genetics, drawing a line between Panama and Colombia is relatively indefensible from a cultural perspective. It would be comparable to, say, drawing a line between Guatemala and the Yucatan Peninsula in Maya studies. That is, it makes little sense. The fact that we have some gaps in our knowledge of the archaeology of Darién and neighboring parts of Colombia is no excuse. As Warwick Bray pointed out in his seminal “Across the Darien Gap” article in 1984, northern Colombia should be considered along with the southern Central American isthmus. There is good reason to think, for example, that the Gulf of Urabá was a significant port-of-trade that helped tie the Central American isthmus with the northern Colombian littoral. This has been acknowledged in studies of goldwork, but I think it will hold up in careful studies of shell, stone, and ceramics as well. I have discussed this with Richard Cooke, and he admits that Panamanian archaeologists haven’t given careful enough consideration to the comparable data from northern Colombia. I think that the Tairona region–the Caribbean littoral as well as the highlands of the Sierra Nevada de Santa Marta–is especially relevant. 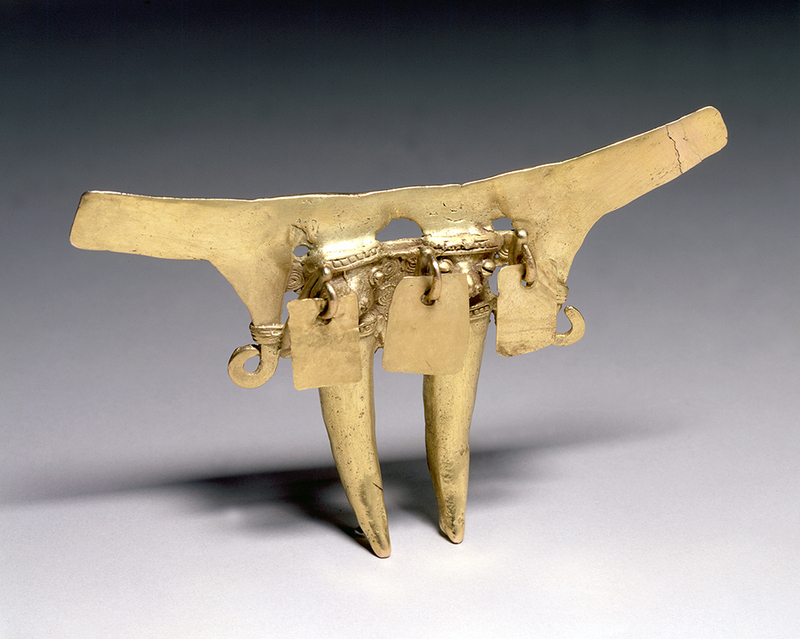 The Kogi/Kaggaba were Chibchan speakers, as were the Muisca, and a “Chibchan World” (my term for what an emic vs. etic model may have been) probably tied Chibchan-speaking peoples of Central America to those of northern Colombia. So far, Colombian colleagues have been enthusiastic in acknowledging this. So, there’s a longish version of my two cents’ worth on the issue. Thanks for starting this blog! James, i am finishing up a project in Nicaragua but would welcome a chat when I get home next week. El concepto de Área Intermedia, acuñado en 1957 por Haberland y desde entonces delimitado con algunas diferencias por Rouse (1962), Willey (1959; 1971) y Lange (1987:23), crea reticencias en la arqueología actual por su denominación y límites, a pesar de su gran utilidad para identificar una amplia área cultural del Centro de América con rasgos comunes, que iría desde Nicaragua hasta la costa norte del Perú. Hoopes y Fonseca (2003:62) propusieron un nuevo nombre y definición, el Área Istmeño-Colombiana, para la zona comprendida entre el este de Honduras, como límite norte, y el occidente de Colombia y el Lago de Maracaibo en Venezuela, como límites sur y este. Según esta delimitación, su límite sur estaría en la frontera de las familias lingüísticas Chocóes y Paez/Barbacoas. Visto desde Colombia este límite presenta problemas, porque fragmenta el Suroccidente Colombiano: áreas Calima, Malagana, San Agustín, Tierradentro, Nariño y Tumaco, de fuertes vínculos con Ecuador y el extremo norte del Perú (Plazas y Falchetti 1983:3). Yo propongo un Área Intermedia que abarque desde el este de Honduras hasta la costa norte del Perú, incluyendo los Andes venezolanos. Esta amplia región cultural estaría dividida en dos grandes subáreas: El Área Intermedia Norte cuyo límite meridional estaría ubicado al sur de las áreas arqueológicas Quimbaya y Tolima de Colombia y el Área Intermedia Sur que comprende el Suroccidente Colombiano, Ecuador y la costa norte del Perú. Plazas, Clemencia. 2007. Vuelo Nocturno: El murciélago prehispánico del Istmo centroamericano y su comparación con el murciélago tairona. Bogotá: Fundación de Investigaciones Arqueológicas Nacionales, Banco de la República y el Centro de Estudios Mexicanos y Centroamericanos Embajada de Francia en México. Panamericana. Muchísimas gracias por la referencia a su libro y por los comentarios desde la perspectiva colombiana. Lo voy a leer lo más antes posible con mucho interés. Gracias, Clemencia. Su libro es una contribución muy importante que merece consideración no solamente por nuestros colegas del Área Intermedia sino los mesoamericanistas tambien. Quiero enfatizar que el concepto del Área Istmeño-Colombiano no intentó excluir consideración del Surocciente Colombiano, Ecuador, y el Perú sino definir un área algo más concentrado para enfocar algunas preguntas de investigación. Hay una tradición en Costa Rica de prestar más atención a los nexos mesoamericanos que a los que probablemente existían con las regiones al sur y tambien enfatizar conceptos como migraciones en lugar de desarrollos locales. Lo veo como resultado del entrenamiento y la orientación general de arqueólogos a través de la historia, pero es complicado. Lo importante es que estas paradigmas cambian y se evolucionan gracias a nuestra atención. Hay objetos metalúgicos quimbaya que se han encontrado en contextos en Panamá central, en las tierras bajas del Caribe en Costa Rica,en Belice y tambien en el Cenote Sagrado de Chichén Itzá. Para mí, las redes de interacción llegan no solamente a las regiones como el Alto Magdalena sino también hasta la Serrania de Bogotá. Como Vd. enfatiza, tenemos que considerar toda la Área Intermedia sin perdernos en la magnitud que representa. Gracias John and James por sus comentarios. Estoy preparando un artículo titulado El Área Intermedia vista desde Colombia donde puntualizo algunos de los elementos presentes en el norte de Colombia (a partir del área Muisca del altiplano y las zonas Quimbaya y Tolima) y ausentes en el Suroccidente del país. En cuanto pueda lo subo a la web para oir sus comentarios. John estoy de acuerdo con los puntos que mencionas acerca de las relaciones entre Centroamérica y ecuador pero tu sabes que cuando hablamos de Costa Rica, Panamá y el norte de Colombia estamos hablando de relaciones mucho mas estrechas, tanto desde el punto de vista lingüístico, genético como cultural. En ese sentido, aunque me parece muy importante tu mención de incluir las antillas dentro del área en cuestión, creo que debemos esperar para no acabar incluyendo zonas de intercambio comercial en un área de relaciones profundamente culturales. El intercambio debió existir de manera usual entre muchas zonas de esta área tropical. que tal si hacemos un esfuerzo por diferenciar esas dos instancias. Yo sé que el asunto es complejo especialmente si nos remitimos a etapas como el del primer poblamiento pero si nos referimos a una etapa que puede encontrarse entre el 2000 aC y el 1500 dC puede ser mas facil de manejar. Lo que yo entiendo por Area Intermedia Norte es la zona que comprende desde el norte de Colombia, noreste de Venezuela y Centroamérica hasta el oeste de Nicaragua, sin el suroccidente colombiano. para mi el suroccidente colombiano más Ecuador y el norte del Perú conformarían el Área Intermedia Sur. Dicha subdivisión no invalida lo que entendemos por Área Intermedia que sigue manteniendo muchos rasgos comunes. yo entiendo lo incomodo del nombre intermedio pero lo que me gusta es que no tiene connotaciones geográficas. mientras no aparezca otro podríamos utilizar esa útil subdivisión. Gracias, Clemencia, por tus comentarios sobre las múltiples consideraciones. Me parece importante considerar la cronología cuando pensamos del Área Intermedio. Espero tu artículo con anticipación!